St. Francisville is a beautiful small town north of Baton Rouge with many interesting, historic homes and buildings. My favorite is Grace Episcopal Church. 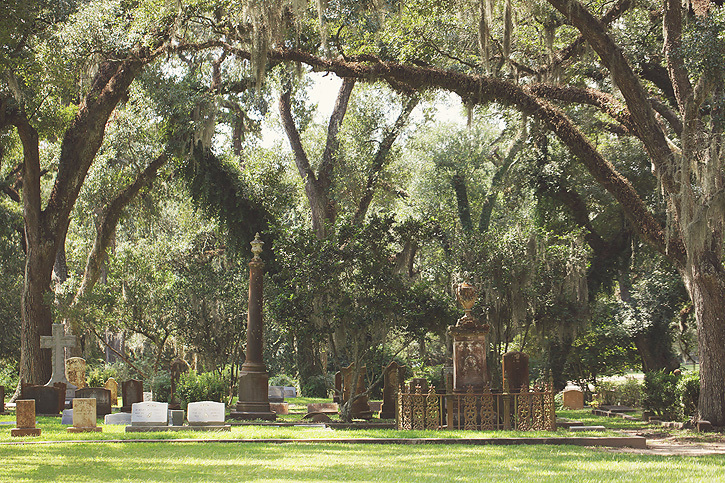 The grounds and cemetery are nestled amongst many moss-covered live oaks. Last weekend, we enjoyed walking around for a bit and I, of course, enjoyed taking some photos. This first one was with my iphone. You can't beat it for a wide view. The rest were taken with my dslr. It's time to show us what you've been shooting! There are just a few rules. Lovely photos, I love old churches. Very beautiful, I love old churches - so many details to capture! Always love the spanish moss. 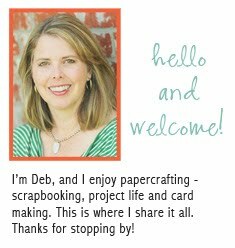 Gorgeous shots, Deb! Deb, what a beautiful place to visit. The moss is amazing! Have a great weekend. Those trees are so amazing! We don't have mossy trees like that up here, probably not humid enough! So beautiful! It reminds me of a church in downtown that I love to visit but you know I've never photographed! I think I need to do that! I was so surprised to open your blog and see pictures of Grace Church. website to see where you have been : ). What a gorgeous church and cemetery! 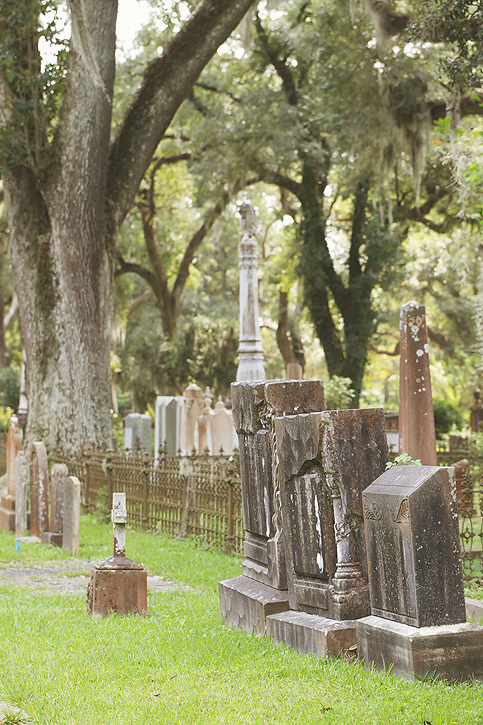 Nice shots- love the trees and the old grave fences. Oh wow Deb- what a beautiful place! I love the trees. Sounds like it was a very enjoyable day to wander & capture. Wow! What a beautiful old church! Great photos. What a beautiful setting for this beautiful old church. What a beautiful church and I just love the moss growing on the trees! Something that you don't see up in my area. I love walking through old cemeteries, they are full of so much history. So lovely, I like the change in the linky too! 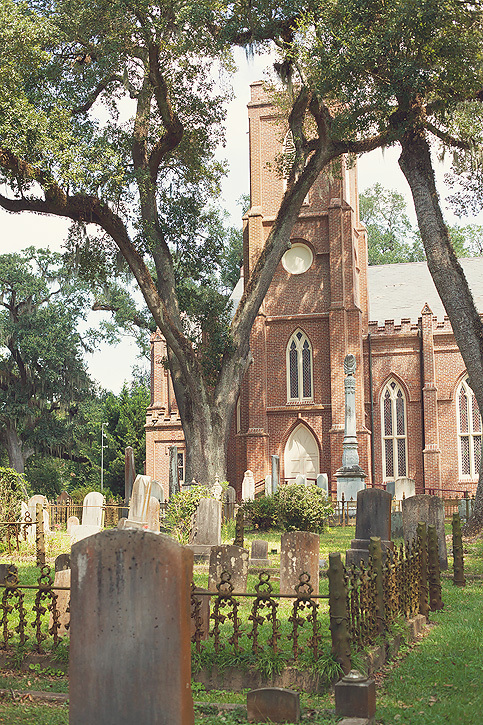 Beautiful old church and cemetery. I love the Spanish moss hanging from the trees and the old, ornate wrought iron fence surrounding one area of old tombstones. Lovely to find your blog. Great linky and lovely photos. What an absolutely beautiful place! Really enjoyed your wonderful photos! What a beautiful place! Love all the hanging moss. 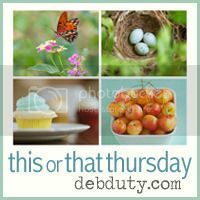 Beautiful setting...I love the intermingling branches in the top of your second photo. So beautiful. I absolutely love old buildings. Fun for exploration. Great photos! 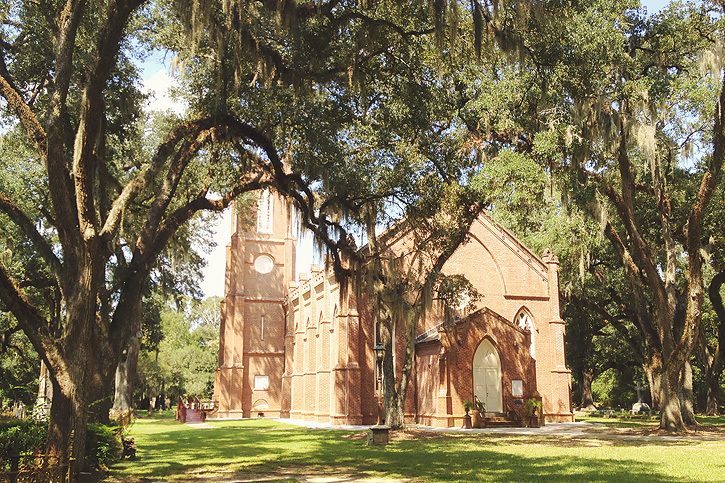 I like the old trees and the old church architecture together, especially in the first photo. Such a beautiful backdrop! Gorgeous shots! great photos! the place just has so much atmosphere! wow! Love your blog- It inspires me to get my camera out more!! Quick question- I so want the 100mm- do you love it or just like it? I really do love it. You can't beat it for macros. It's nice for portraits too as long as your subject is relatively still. It's slow to focus.